Is the end of brick and mortar near? How could nanotechnology change buildings and cities in the future? A speculation of The Why Factory on this topic is illustrated in the best tradition of science fiction in the newly published book Barba. Life in the Fully Adaptable Environment. It forms the point of departure for a series of interactive experiments, installations and proposals towards the development of new, body-based and fully adaptive architectures. A beautiful existential story comes alive. A story closer to us then you’d ever have thought. Imagine a new substance that could be steered and altered in real time. Imagine creating a flexible material that could change its shape, that could shrink and expand, that could do almost anything. 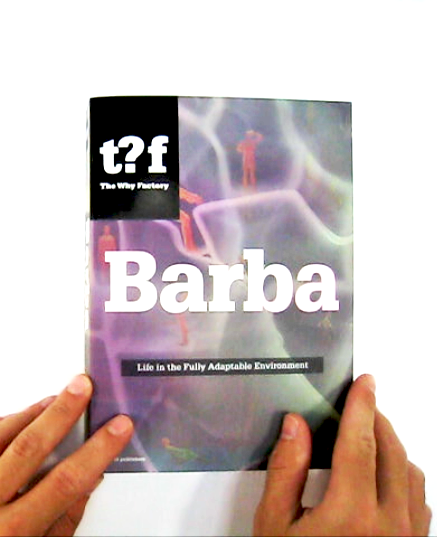 The Why Factory calls this fictional material Barba.